Business-class performance VPN gateway. Support all the industry-standard VPN protocol, including PPTP, L2TP, GRE, IPsec, IKEv2, and OpenVPN. Multi-WAN routers for better reliability and higher throughput. DSL Modem, Firewall, VPN Router, all-in-one solution. Business-grade wireless access point features AirTime Fairness, Band Steering, Built-in RADIUS server, and AP-Assisted Roaming. Switches that offers advanced VLAN and security features. Centralized management software for Vigor Routers, VigorAPs and VigorSwitches. New features include IKEv2-EAP, now available for Vigor2133, 2762, 2926, 2862, 2832, 2952 and 3220 series. The entry-level xDSL Router with built-in LTE connectivity. Looking for the right router? Compare all DrayTek routers to find the one that best meets your network's need. 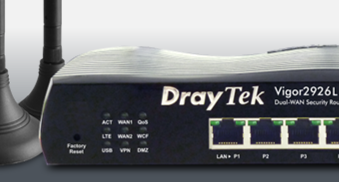 What makes DrayTek Router an easy choice?